The Hawthorns stadium has been home to West Bromwich Albion since 1900 and was the last football league ground to be built in the 19th Century. Today, the ground has a capacity of 27,000 and has undergone several renovations, including the most recent West stand expansion in 2008. The Hawthorns has been home to West Bromwich Albion since 1900, and was one of the last grounds to be have been built in the 19th century. 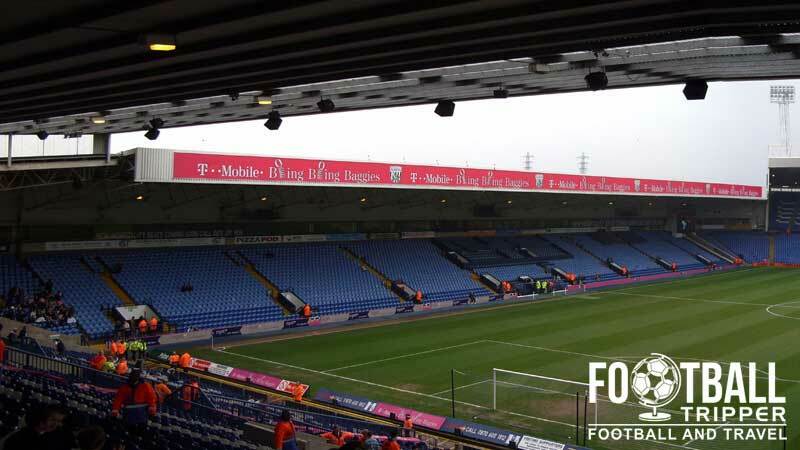 Although the club have enjoyed over 115 years at the Hawthorns, the ground is in fact the sixth home in the West Brom’s history, having lead something of a nomadic existence in the first 22 years since forming. Situated close to the borders of Handsworth, the new location was much more spacious, and it is arguably one of the reasons why The Baggies have been able to remain at the same ground for such a long time. Historically English stadiums were built within residential areas, however West Brom bucked the trend of the time and anticipated the trend of 1990s out of town relocations. Signing a lease which gave the club the opportunity to purchase the land within 14 years, something which the club later did in June 1913, The Baggies had to first clear the area before they could construct the planned 35,500 capacity ground. The main obstacle that needed to be cleared were hawthorn bushes, and it is from these plants that the stadium’s name is derived from. The official record attendance for a league match was set against local rivals Wolves on 4th March 1950. Recorded as 60,945, this gives you an idea of the size of the Hawthorns at its peak, however unofficial reports estimated that over 80,000 fans crammed into the stadium on several occasions including during a fifth round FA Cup tie against Newcastle in 1954. By the early 1990s The Hawthorns was beginning to show its age, and after the publication of the Taylor Report both the Smethwick End and Birmingham Road terraces were rebuilt which reduced the capacity to just over 25,000. In 2001 the club construction a brand new East Stand which fully enclosed the stadium. Hawthorns is comprised of the following four stands: Birmingham Road End (North), The East Stand, The FCL Global Smethwick End (South) and the Halfords Lane stand (West). Away Fans who visit Albion’s ground are housed within one half of the Smethwick Goal end which is shared with the home supporters. The standard allocation of around 3,000 tickets is often increased for cup matches, and when this happens the 5,000 or so fans more or less take over the entirety of the stand which creates a lot of noise! 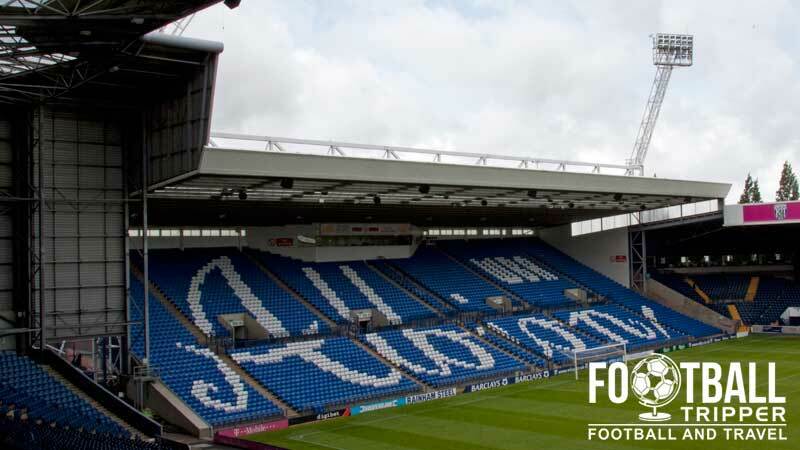 Situated behind the southern goal-end, The Smethwick end is a single-tiered construction divided into six sections of seating by five rows of stairs with the stadium control centre located in the middle at the top. As a fairly modern construction there are no intrusive support beams and the roof is raised high enough to ensure that good amounts of natural light enter the Hawthorns and no views from the top are restricted. With a lack of suitable away friendly pubs close to West Brom’s ground many fans choose drink beforehand at the stadium itself, which isn’t a major issue except the concourse is quite small. Located within Middlemore Industrial Estate the Hawthorns isn’t exactly heaving with boozers, with the three closest to the ground all around 20 minutes or so away on foot. To the east of the ground on Holyhead Road (Birmingham Road) there is The Royal Oak which is a standard pub with television screens, and decent atmosphere with the added bonus of Chinese food. To the west off the roundabout just across the M5 there is the Park Inn “contemporary hotel” which has a decent sized bar, and welcomes both home and away fans. Five minutes further south is The Vine which is probably the most popular of the three. Combined with a Tandoori restaurant it is noted for having decent space with friendly punters and staff. North-east of the ground just before the bus stop on Birmingham Road is a McDonalds which does a roaring trade on matchdays. Being the only franchise within the area it has a virtual monopoly in this sense, with the only direct competition coming from the burger vans, and food on offer inside the concourse. If you have read the aforementioned pubs section you might want to try the Indian Food on offer at The Vine, or failing this, the local delicacy of a Chicken Balti pie at the Hawthorns. The club shop at the Hawthorns is open during the week and for 30 minutes after the full time whistle. Failing this you can purchase Baggies merchandise online via the WBA E-Shop. The Hawthorns Stadium tour is a unique opportunity to go behind the scenes at the much loved club. 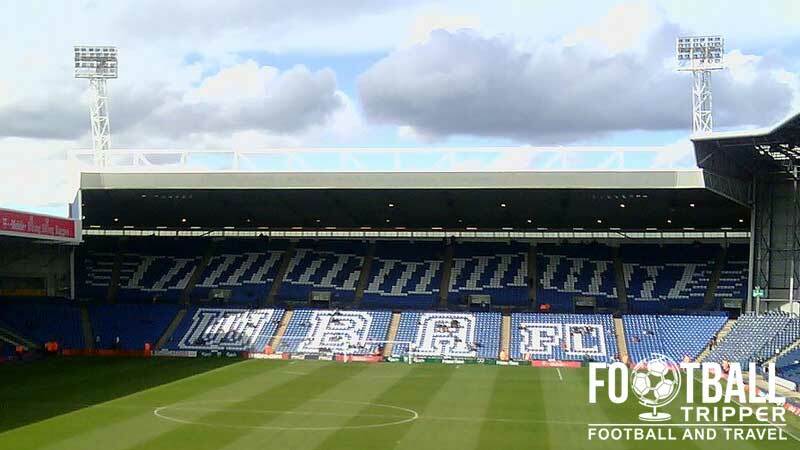 West Brom run these events very infrequently at around once a month unlike say Manchester United, so it’s worth snapping up tickets when you get a chance and checking the official website for the latest news. Tickets cost just £10.00 for adults and £6.00 for everybody else, and are available by phoning 0871 271 1100. West Brom operate a two-tiered ticket pricing system for their home matches for the Premier League with illustrative prices shown below. 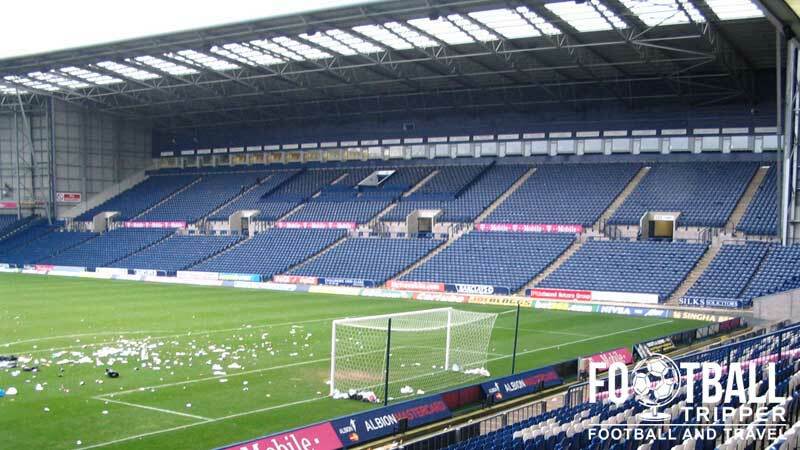 The Hawthorns is 4 miles North West of Birmingham City centre and 1.5 miles South East of West Bromwich High Street. Birmingham Road, West Bromwich, West Midlands, B71 4LF. The official club website recommends parking at either the Tom Silk Car Park which is 100 metres along the main road, or the East Stand Car Park. 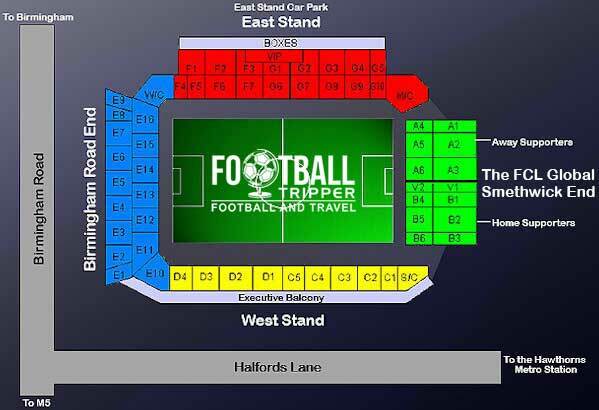 Both tend to fill up very quickly on matchdays, so you best get there early if you’re planning on getting a space. The Hawthorns is served by its very own rail and metro station which is approximately 5 minutes away from the ground. You can access it from Birmingham New Street by taking a train to Smethwick Galton Bridge and then changing platforms there taking no more than 25 minutes. which is very convenient. If you know your way around Birmingham you can always walk to either Moor Street or Snow Hill station where the metro line runs direct to Hawthorns every 20 minutes or so taking around 10 minutes once it has departed. This is undoubtedly the easiest option. The Baggies in a buoyant mood. From Birmingham you’re looking at the number 74 and 75 buses which depart outside the Wetherspoons known as The Square Peg on corporation street (Shown in the map above). If you’re coming from Wolverhampton for whatever reason then you can jump on the 79 to get to the Hawthorns. At 21 miles away Birmingham International airport is the closet commercial air hub to the Hawthorns Stadium with an estimated drive/taxi time of 30 minutes. Birmingham New Street, Snow Hill and Moor Street all in the centre of Birmingham are all one stop away from the airport. The two closest hotels to the Hawthorns are Premier Inn West Bromwich Central and the Park Inn Radisson which are both a short drive away. If you’re looking for more options, there’s always Birmingham which is 20 minutes by car or only 10 minutes direct via a train. The Ramada at the Mailbox is always a pretty nice and failing that there’s the Holiday Inn tucked behind Birmingham New Street station.